Pitcher on right just opening up with flared peristome. Will darken with age. N. maxima "Frederik Meijer Gardens"
Nepenthes maxima is a highly variant species. They come in striped pitchers, green, red peristomes, blackish peristomes, etc. There are many different clones and locality varieties that make this species very interesting. N. maxima is a great starter plant for all of the right reasons; cheap, pretty, vigorous grower, and tolerates a wide variety of growing conditions. I grow my N. maximas as highlanders outdoors although there are some lowland varieties that could be grown indoors though I don't own any of those. 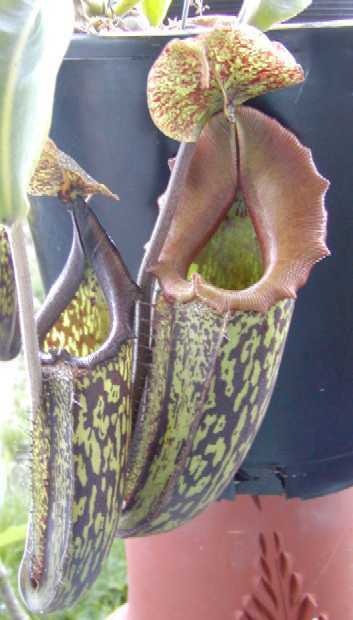 The lower pitchers tend to be a little more "tubbier" and colorful than the upper pitchers while the upper pitchers get more cylindrical and can be less colorful than the lowers. I've noticed this with my "pierenensis" variety that the uppers really lack any striping and stay mostly green. This is also true with my hybrid N. maxima X ventricosa. The lower pitchers are really nice while the upper pitchers stay only green. There seems to be so many varieties of N. maxima, you could own an entire collection of them. This species makes an excellent hybridizer because of its hardiness and versatility. I N. maxima up there with N. ventricosa and N. alata as a great starter species for beginners. Species variability: lots! lowland and highland forms, locality names like "Irian Jaya", "Borone", "Tlatawiran", and color differences.